The Air car is a car currently being developed and, eventually, manufactured by Moteur Developpement International (MDI), founded by the French inventor Guy Nègre. It will be sold by this company too, as well as by ZevCat, a US company, based in California. 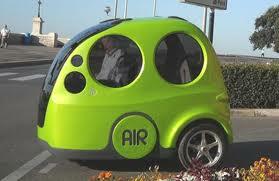 The air car is powered by an air engine, specifically tailored for the car. The used air engine is being manufactured by CQFD Air solution, a company closely linked to MDI. The engine is powered by compressed air, stored in a glass or carbon-fibre tank at 4500 psi. The engine has injection similar to normal engines, but uses special crankshafts and pistons, which remain at top dead center for about 70% of the engine’s cycle; this allows more power to be developed in the engine. Though some consider the car to be pollution-free, it must be taken into account that the tanks are recharged using electric (or gasoline) compressors, resulting in some pollution, if the electricity used to operate the compressors comes from polluting power plants (such as gas-, or coal-power plants). Solar power could possibly be used to power the compressors at fuel station.